Graham Tire is known for their world class customer service, nationwide warranties, and everyday low prices on quality tires and auto services. Shop for tires confidently & find the tire brand you love, whether that be for your pickup truck, SUV, sedan, Jeep, or coupe; many customers consider us the best tire store in Lincoln! Ask our technicians about reviews and general tire care tips for your vehicle so you don’t have to worry about having your tire repaired; our wheel experts will gladly help you. For over 60 years, Graham Tire has been known as ‘The Place to Go’ for Goodyear tires in the Midwest but also features other quality tire lines such as Dunlop, Kelly, Hankook, Cooper and Titan. We are Lincoln, Nebraska’s favorite tire dealer! You will get the best car repair Lincoln NE has to offer. Whether you need routine auto maintenance services or necessary car repairs our tire & auto shop has got you covered. We’re often told that we’re the best auto repair shop Lincoln NE has to offer! You can schedule your appointment online, visit us during business hours, or take advantage of our convenient Pick-Up and Delivery service. After my car broke down I was given a ride to work, doing everything they could to help me get where I needed to be. They didn’t just settle for the initial diagnosis of what was wrong with my car, but found another issue along the road- which ended up saving me a ton of money, by not fixing what didn’t need to be fixed/replaced! They helped so much and were so kind any time I interacted with them & had excellent customer service. Stopped in on a Friday in the eleventh hour with a bulging sidewall. They got me in and back on the road in 45 minutes for a fair price. Really appreciate it. We were visiting Lincoln in a rental car and got a low tire pressure indicator. We stopped at a tire place on O Street at 5 pm, and, although their sign said they were open till 5:30, they said they could not help us as they had already turned off their machine. With severe weather beginning, we went to Graham’s at 5:20pm. They were friendly and said they would do whatever it took to get us on the road. They found a nail in the tire and repaired the tire, even though it was after closing. They went above and beyond and we were able to get on our way. They showed the same courtesy to others who came in and called in while I was waiting. If you ever need car service or tires, Graham’s is the place to go. Thanks for being there today when I needed you. I appreciate your friendly and helpful service. I have a long history of being one of your satisfied customers. We have used Graham Tire for our automotive needs for over 40 years. I trust them. Excellent service every time. Have been using the 68th an O location for about 10 years. They get me taken care of whenever I need oil/tire/alignment services. Highly recommended crew there. By far the best experience I have had with an automotive place! Zero complaints whatsoever. They were so helpful! They worked with my class schedule and for me in when they could. They were quick and saved me a ton of money! Had a tire off of a fertilizer spreader that needed filled. 2 other tire stores couldn’t get it filled because of the small size. Graham got it filled. They didn’t even charge me! Fantastic service, will return for other repair work. I took my car here to get some brake and shock work done, it ended up taking so much less time than I imagined! All of their staff are super friendly and helpful, and they are very clear with what servicing your car needs. This will be my go-to place for auto work from now on! Graham went out of it’s way to provide me a ride home and back to the shop once my car was finished. Great customer service. We’ve been going there for years! Graham Tire is known for its excellent customer service, nationwide warranties, and everyday low prices on tires and auto services. Graham Tire only provides consumers with the best quality brands including: Goodyear, Dunlop, Kelly, Hankook, Cooper and Titan. Graham Tire is not only a great place for you to purchase your new tires, we also offer complete automotive repair services. 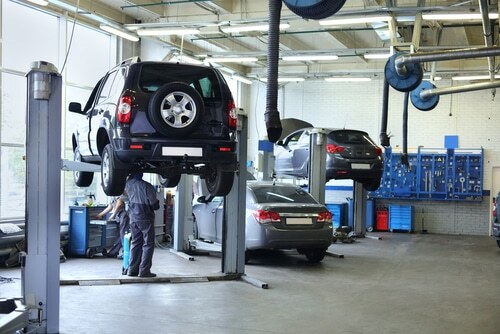 These services include oil changes, vehicle alignment, tire rotation, brake service, shocks and struts, nitrogen, batteries, computerized diagnostics, tire repair and many others. Graham Tire is your one stop solution for all of your vehicle needs. Graham Tire is known for its excellent customer service, nationwide warranties, and every day low prices on tires and auto services. Graham Tire only provides consumers with the best quality brands including Goodyear, Dunlop, Kelly, Hankook, Cooper and Titan. Graham Tire is not only a great place for you to purchase your new tires, we also offer complete automotive repair services. These services include oil changes, vehicle alignment, tire rotation, brake service, shocks and struts, nitrogen, batteries, computerized diagnostics, tire repair and many others. Graham Tire is your one-stop solution for all of your vehicle needs.